"Tibetan Culture in the 21st Century" is the theme of this year's Tibet Week, which begins Monday, March 20, and wraps up on Saturday, March 25, with daily events including discussions, meditation and the traditional mandala sand painting. 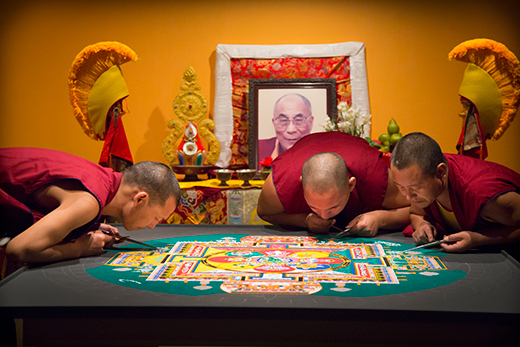 The Opening Ceremony begins at noon Monday in the Michael C. Carlos Museum's Ackerman Hall, led by Geshe Lobsang Tenzin and the monks of the Drepung Loseling Monastery in Atlanta. Also that day, the live exhibition of mandala sand painting, a tradition of Tibet Week, will commence. This year, the monks will construct a mandala of the White Tara, a female Buddha representing enlightened wisdom, carefully placing colorful grains of sand into an intricate design. The sand painting continues daily through Friday from 10 a.m. to 5 p.m. The following day, Saturday, March 25, families can try their skills at Tibetan sand painting. Adults and children can use Tibetan cha-purs and colored sand to create a sand painting. This event is free for Carlos Museum members; $10 for non-member adults; $8 for children and free for children 5 and under. Registration is required. Another tradition of Tibet Week — guided compassion meditation — will be held Monday through Friday at 5 p.m. in Ackerman Hall, except for the March 23 session, which takes place in Cannon Chapel, room 106. Each day of Tibet Week will feature a talk or panel discussion on the political, cultural, educational or religious aspects of Tibet. All events are free and take place in the museum's Ackerman Hall unless otherwise noted. The first talk, entitled “In Search of Home: Tibetan Migration in the Diaspora,” will be Monday at 7:30 p.m. Tibetan lawyer and Emory School of Law graduate Tsering Choeden and Bruce Knauft, Samuel Candler Dobbs Professor of Anthropology, will discuss the effects of the Tibetan diaspora. Jim Wynn, project coordinator for the Emory Tibet Partnership, will moderate and a question-and-answer session will follow. On Tuesday, March 21, at 6:30 p.m., Ellen Gough, assistant professor in Emory College’s Department of Religion, will give a gallery talk in the South Asia galleries about the four different images of Buddha in the museum’s collection. At 7:30 p.m. on Tuesday, “Tibet in the 21st Century: The Middle Way” will be the topic of a talk by Penpa Tsering, representative of His Holiness the Dalai Lama to North America and former Speaker of the Tibetan Parliament. He will talk about current political policy and opportunities and challenges surrounding the future of Tibet. A panel discussion entitled “Education of Heart and Mind: The Dalai Lama’s Vision for Education in the 21st Century” will be Wednesday, March 22, at 7:30 p.m. Lobsang Tenzin Negi, professor of practice in the Department of Religion, will moderate the discussion. Panelists are Geshe Lhakdor, director of the Library of Tibetan Works and Archives; Barbara Dunbar, developmental psychologist; and Chuck Raison, Shannon Chair for Healthy Minds, Children and Families at the University of Wisconsin. “Women Luminaries of Tibet” will be the topic of a talk on Thursday, March 23, at 7:30 p.m. Tsepak Rigzin, lecturer in Emory College’s Middle Eastern and South Asian Studies department, will discuss influential spiritual and political women leaders of Tibet and their legacy. Geshe ma Namdol Phuntsok, one of the first 20 Tibetan nuns to complete the geshe degree in Buddhist philosophy, will also share her historic journey. Tsetan Dolkar, program coordinator with the Emory Tibet Partnership, will moderate. Prior to this talk, at 4 p.m., Tara Doyle, senior lecturer in Emory College’s Department of Religion and director the Tibetan Study Program, will discuss a 15th century image of the goddess Lhamo, protector deity of Tibet. Doyle’s talk is part of the museum's AntiquiTEA series, which features talks by museum curators and Emory faculty and graduate students discussing works of art in the museum’s collections and exhibitions. Tenzin’s talk will be followed by the closing ceremonies and traditional dismantling of the White Tara sand mandala by the monks of the Deprung Loseling Monastery.